If you think of Nigerian-born painter Ekene Maduka as singer, you can hear her dashing from high pitched eccentricities to hushed lullabies to wordless chanting and back to dramatic, tuneful wailing within a single song. You might also find yourself holding back a giggle, not because of her over-the-topness, but because she knows how to weave in an equal measure of levity. You know she is not being seriously serious, but only kinda-sorta. 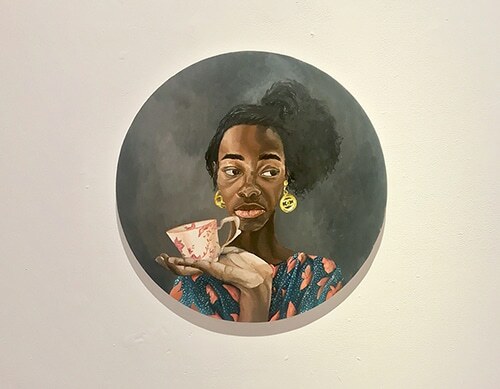 Maduka’s series of paintings for her exhibition Walk Back Home, now on display at La Maison des Artistes Visuels Francophones, act like a compilation of short stories that offer snapshots of a peculiar cast of characters. These brief switch-ups linger long after you’ve moved on to the next image due to Maduka’s virtuosic detailing with her brush. Across eight or so stretched canvas and circular wood panels in multiple sizes, we see the image of the same figure reappear in different outfits, shiny bling, and varying moods. Said figure is, of course, the chameleon Maduka. Her method is less Cindy Sherman identity swapping critique and more a way of relating to her family. She traces how her own individuality is inscribed by parents and siblings. Part of the collection sees her playing the part of her father, mother, and sisters as well as alternates of herself. In one image she even has a twin and they appear to be in the middle of pampering each other as if getting ready for their close-up. In another rendition, we see a figure in a traditional Gele head wrap caught laughing hysterically. Each version of Maduka is dressed to impress and cast against a nondescript backdrop, not unlike any of art history’s favourite 17th Century European painters. But she quietly rejects tradition and instead opts for something close to the here and now. As a by-product, we see something that’s uniquely hers and sits outside of a specific historical moment. Walking through the exhibition we encounter works leaning casually in a corner, in the window panels, or edging off the walls – all which add to the wonky, off-kilter depictions in the picture planes. Perhaps the most formally uncharacteristic piece, Longings for Ulo, accentuates the distinctive misdirection undergirding Walk Back Home. Rendered in photographic detail, the painting captures the delirium of Maduka’s own sense of displacement. We see her looking out at us from a desolate winter landscape. You can feel her shivering in discomfort. She looks like a stranded passenger in the middle of a storm. All she has is her ECOWAS passport ID. You want to reach in and give her a ride, but you can’t help but be amused by the larger-than-life fur on her parka. Maduka knows how to render an earnest inward gesture only to distract from it with humour. And she’s only laughing with us because she’s got to get through the day somehow. It might be out of line to say a show of paintings depicting the likeness of the human form is abstract, but that’s a designation that is very much parallel here. Much of what Maduka communicates seems to point in multiple directions all at once. We are seeing her over and over again, and each time it’s like seeing her for the first time. 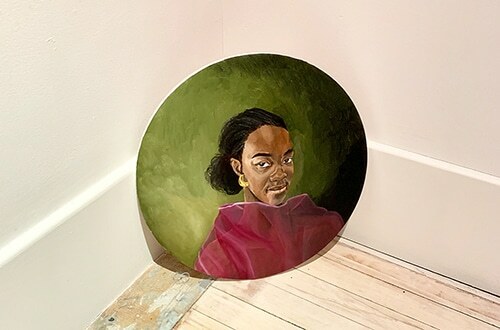 Her approach to portraiture not only refocuses the potential for contemporary figural painting, but it reinforces the idea of creating a portrait as elliptical and irresolvable. Ekene Maduka: Walk Back Home continues until March 2.